The sun was shining when we drove on Highway 218 to the Eastern Iowa Airport for our trip to New York City. 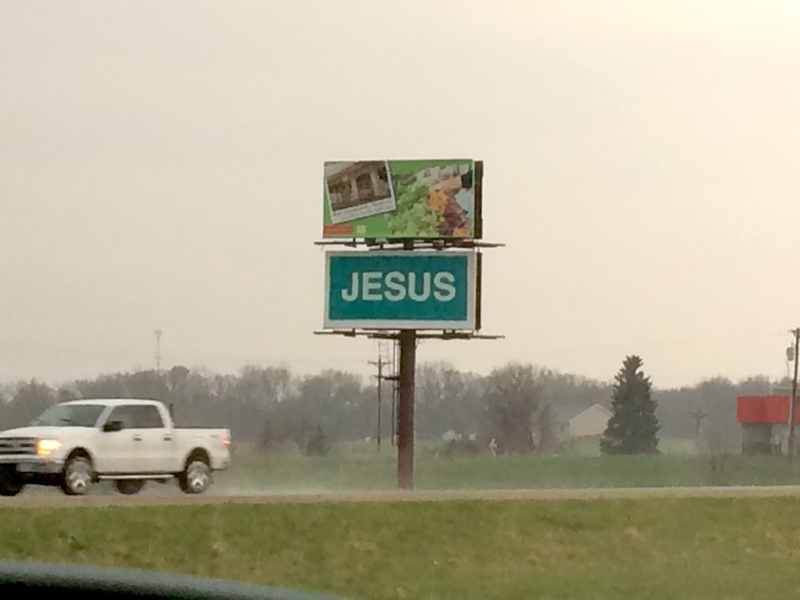 On the way up I noticed 3 consecutive billboards along a section of highway between Washington and Iowa City. Were they telling drivers a story? The sequence of signs seemed to indicate a battle between the forces of good and evil, and a way to deal with the conflict. It cracked me up, and I pointed them out to my son. We didn’t have time to stop and take pictures, but planned to do so on the way back. It was raining on the return trip home, but we managed to access both sides of the highway using conveniently placed crossings. Nathanael lowered the window and captured the billboards with his iPhone. Click on each photo to enlarge them, and then on the return arrow left of the URL to get back to this page. 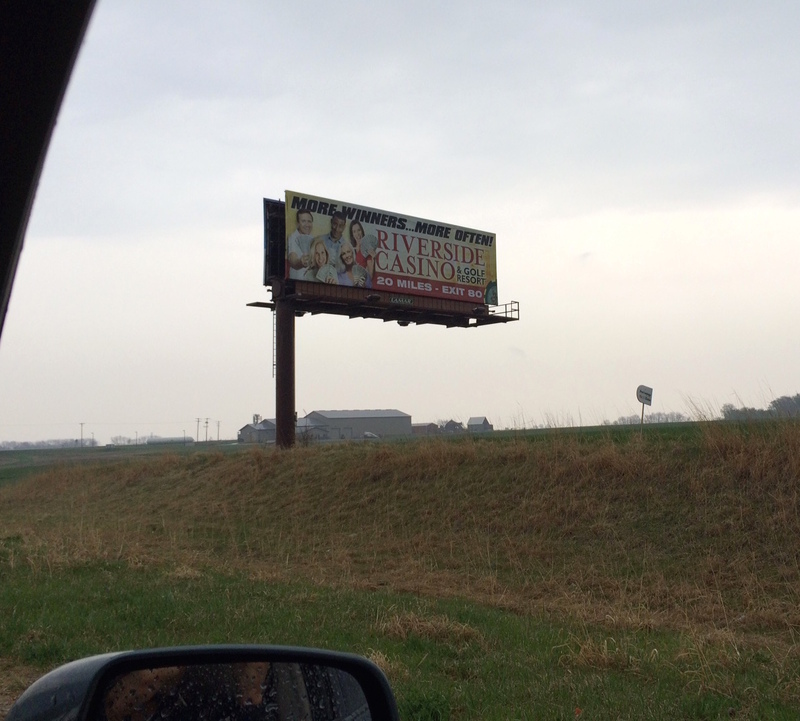 On the right side of the highway, I saw a familiar sign advertising the Riverside Casino, promising more winners more often. I looked across to the other side of the highway and there was a double sign. The bottom one spelled out, JESUS. 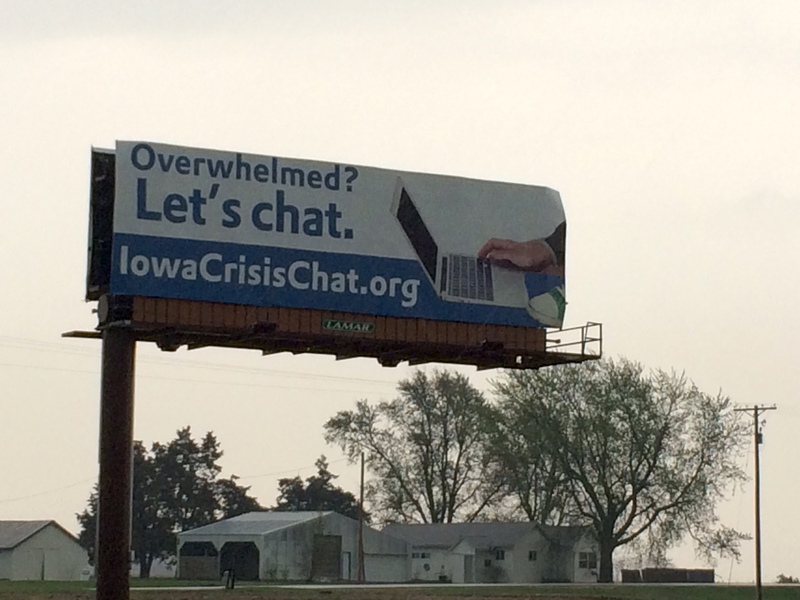 Then further up on our side of the road was a sign for an Iowa Crisis Line that said, Overwhelmed? Let’s Chat. Was it offering a chat line for people overwhelmed between both opposing billboards competing for our attention—the evils of gambling and salvation in Jesus? Makes you wonder if each sign was deliberately placed to counter, or take advantage of the other? I thought to myself, Only in Iowa! See the poem and video from that trip: A NEW YORK HAIKU, and a few links about my nephew’s film, The Driftless Area, which premiered at the Tribeca Film Festival. This entry was posted on April 26, 2015 at 1:10 pm and is filed under Humor. You can follow any responses to this entry through the RSS 2.0 feed. You can leave a response, or trackback from your own site.